Caption slip reads: "Photographer: Lapp. Date: 11-27. Reporter: Ostler. Assignment: Juvenile Hall doll party -- General Hospital. 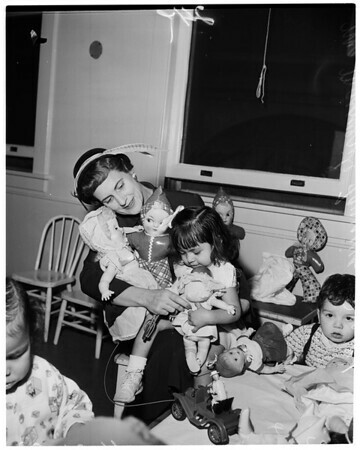 23-24: Mrs. Marguerite Fanning, chairman of the annual Juvenile Hall Doll Party with dolls and two-year-old girl of the Hall."